Hello Lovelies I hope you're having a fabby day. Todays post is going to look at the season I think most of us look forward to, summer! I think the majority of people will agree there's nothing better than waking up to the sun shining and the feel of the warmth on your skin. with this in mind I've curated a collection of crochet patterns (all free!) that I feel are the must haves for the summer season. There's patterns for everyone here, kids clothing and accessories, hats, sandals, and what I believe is a beach essential, a gorgeous summer bag to carry everything in. Lets delve in and see what the season has in store, (click the link title above each pic for the patterns). Aren't these delightful?! The pattern (if you're used to making granny squares) is super easy and they look effortlessly stunning (of course we all wish we had great legs for these! ), and they can be made in whichever colour you please, and so customised to your tastes, or outfit. They are also easily and quickly worked up, you could make a pair to match every outfit, and they wont weigh an ounce in your luggage (now that's a win right?). You can also adapt these for the mini me's in your life and if the feeling takes you have matching outfits! The possibilities with these are almost endless, I love them! Now this isn't really a pattern a beginner would want to take on. The construction although not to complex has to be precise, and may be complicated for a beginner. The diamond pattern in the dress is gorgeous, and perfect for those hot days, covered and cool, and great with or without shorts. The instructions are super detailed (as is the sizing guide), and I am a big fan of 1dogwoof (those jellyfish! ), her tutorials are always very easy to follow and very detailed. This is a great wardrobe staple for the kiddos, and again can be made in any colour that takes your fancy. Now im sure you'll all most certainly have heard of the gorgeous Miki at SFMGS (if not where have you been! check her out here). I am in love with her instagram feed, and love the patterns she produces. They are bright and instantly make you smile. 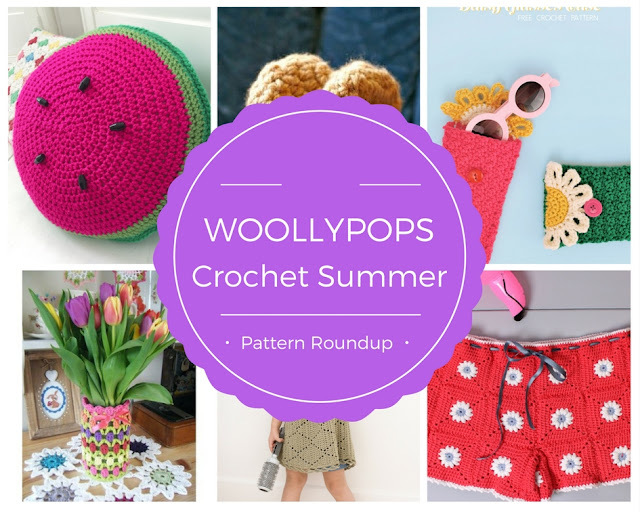 So I could not curate a summer pattern roundup without including her in it. These granny square shorts again if you're familiar with grannys are super easy to work up and quick. The construction is a little more complicated, however the detailed pictures will help you along, and the beauty about these is that you can adjust the size to you, bigger size bigger granny square, making it for the kiddos, smaller granny square, it is that simple! Another great thing about this pattern is that its featured on the hobbycraft blog, so you can instantly add all of the required materials to your basket, click them to your door and voila you're ready to go. Now we all need a stylish yet practical pair of sunglasses in summer. So why not have a stylish yet practical case to go with them. This pattern compromises of two elements, the case, and the daisy flap. The case is super easy and suitable for beginners, a beginner may struggle with the flap, however the instructions are great and detailed, and this is a photo tutorial (this always helps me so I know what the piece looks like at each stage) so I think as a beginner you would be fine. There are also links to techniques that you may struggle with which is great. Isnt this case so cute?! I'll deffinatley be hooking up one of these. So you're enjoying the sun in the garden on a hot day, you glance over to your gorgeously decorated garden, and the added accents that this jar cover brings. Yes, these jar covers make great indoor and outdoor décor for summer, add a tealight for the summer evenings to really make them shine. This is a downloadable PDF pattern (free on Love Crochet but you will need to sign up to the website). The tutorial is very detailed, and has lots of great images. Very easy to follow and all stitches and colour changes are explained effectively. It looks great too, I love how bright this is, and also how the designer explains how to change up or down the size to fit your desired jar. I love! colour, as you probably already know. Fruits and kitsch décor like the above are so hot right now, that I couldn't not add this in. 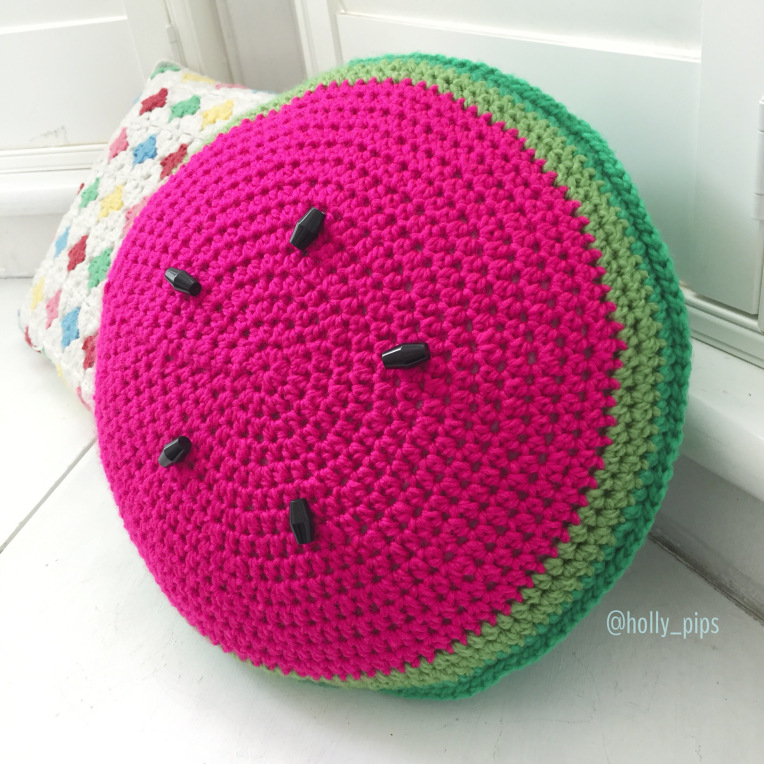 This crochet pillow will look great on any deck chair, hammock, bench, the list goes on, and is so bright and welcoming! The pattern is made in the round, and compromises of a few simple sticthes. Construction is relatively easy, and the tutorial has some great images and instruction. The toggle buttons, as explained in the tutorial, can be replaced with sequins, embroidery etc, and its so cute! 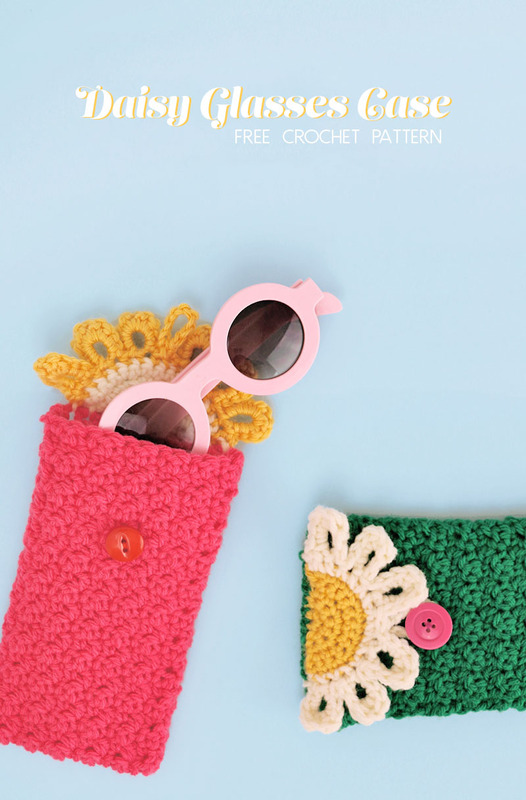 The good thing about this pattern is that its made using bulky yarn and a large hook so works up quickly and your stitches are easier to see, not only that is once you have mastered crocheting in the round you could make all sorts of fruits, lemons, oranges, etc. and have a suer fruit array of cushions. 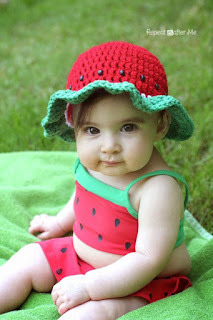 I know, I know, another watermelon, but isn't this adorable, im sure its forgiven if its adorable, right? Another Crochet Queen here, Sarah Zimmerman from Repeat Crafter Me. I love her site and her tutorials, and her work is stunning, so its no surprise that ive chosen one of her patterns as part of this roundup. Sarah's hats are all amazing, and I especially love this one. As with all of he hat tutorials theres is abroad range of sizes and instructions to choose from, and all of the instructions are clear and detailed. Even adding the beads in to the brim should be a doddle with her guided instructions. Another fab project for summer. Another cute pattern, I wanted to add a boys pattern as you see soooo many girls sunhats on Pinterest, it seems like the boys are always left out, right? 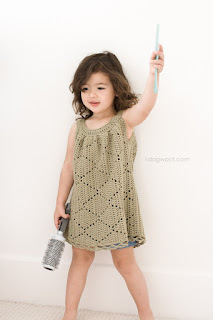 This pattern again is adorable, and the designer states that its very quick to work up, with no sewing involved! Yay! Skill level is for beginner/advanced here, the front post single crochet stitch is used (FPSC) and a half double crochet together (HDC2tog) so I would ensure you are familiar with these stitches before attempting this. 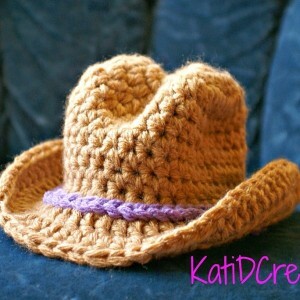 This hat is only in newborn size im afraid, but would be easily adapted to fit a larger head. These are cuties aren't they? 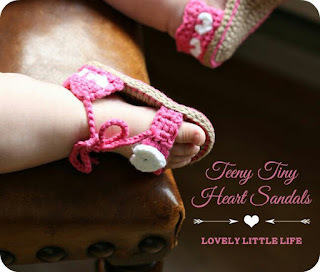 I love baby sandals, they look incredibly sweet, but alas I have no recipient for such things so very rarely make them. Baby sandals aren't a favoured beginner project as they take a bit more skill (working in an oval, attaching complex bits, fiddly stitches etc) however don't let me put you off, i'm deffo a big believer in perseverance! So onto the pattern, the instructions are well written and staged so that no detail is missed. 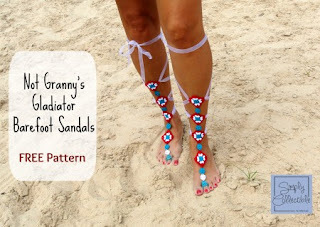 The pattern uses cotton yarn (which is a given for summer sandals) and three hook sizes, so please do read carefully when you require a change in hook. Don't forget to make 2 also! Is this not the most gorgeous bag?! I love the colours used (note the phrase 'taupe is dope' is used here! ), the nautical rope detailing of the handle, the gold eyelets that the handle is fed through, the stitch used, its just amazing, and the fact its designed by one of my favourite bloggers of all time makes it an instant hit with me. The bag itself starts with simple stitches to form the foundations, then progresses with griddle stitch, this stitch is super easy to learn and works up fast too., and handily theres a tutorial link to it in the pattern for those of you unfamiliar with the stitch (she's a superstar that sewrella!). 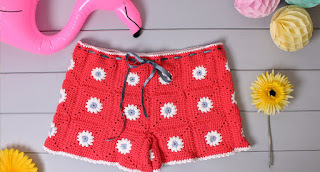 Even adding the eyelets wouldn't put of a beginner as the instructions are so well written a great pattern for summer, and to stuff all those beachy essentials in. I love crochet flowers, and I didn't think it would be right to do this roundup without including some. Here we have them, a super cute, very festival-ish (that's not a word I know) daisy headband, exuding all things summer, and a great addition to any outfit. Daisies are probably my fave flower, they're versatile and cute and this is great because it can be made for little and large heads alike. Both headbands are suitable for a beginner, and what's great is you can adapt these quite easily to make them into necklaces, bracelets, anklets, you name it. 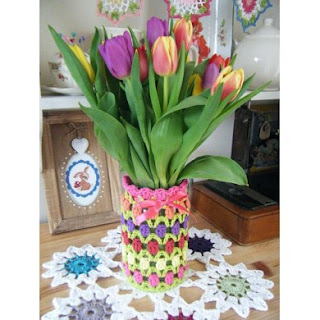 A bonus here too, you get two patterns when you download this, the patterns are free but you do have to create an account to access them, however its well worth it as there's loads of great free patterns on this site. There we have it. A selection of great summer essentials, now go forth and buy yarn! For a handy place to see all of the patterns together visit my pinterest board here.